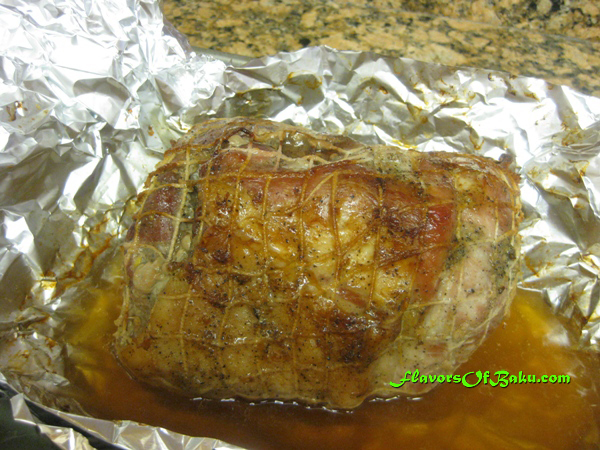 BUZHENINA is a slow roasted Russian style ham. 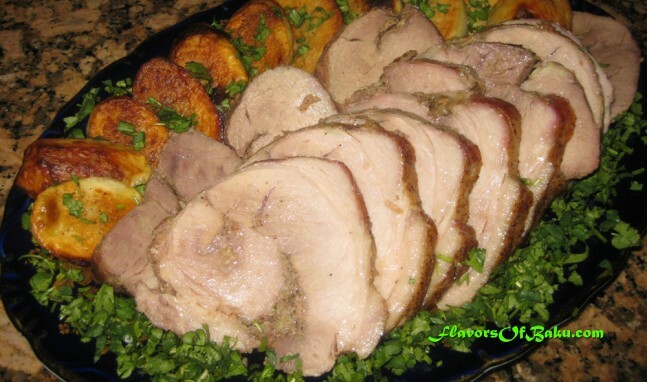 The boneless leg of pork (or lamb) is usually sold in an elastic meat net that constricts the meat into a formed mass. 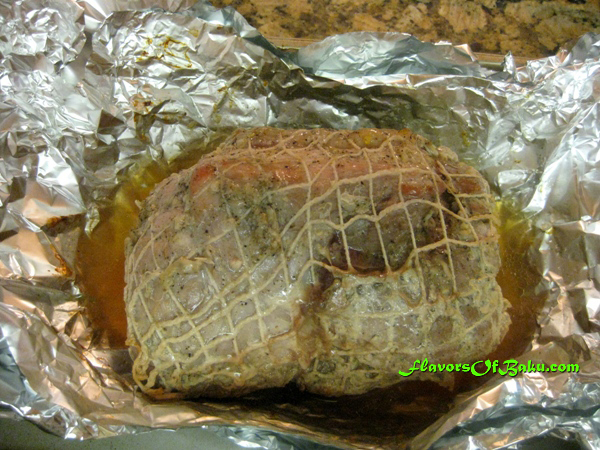 This net is very helpful in preparing the meat as a roast because it allows it to hold its form. As an alternative, you can use the butcher’s twine (or cooking string) to keep your meat formed. Mix the crushed garlic, salt, and pepper together. Spread this mixture all over the meat. 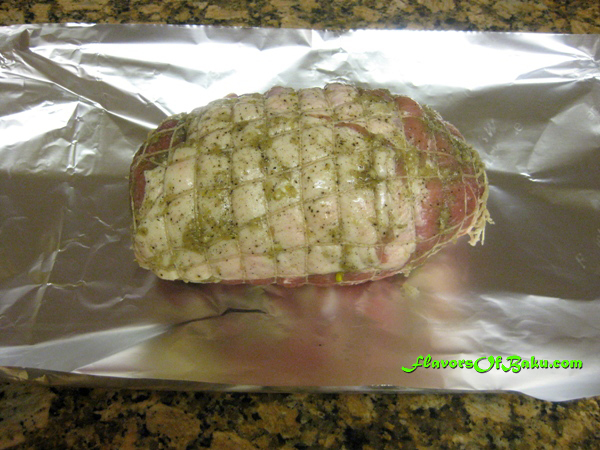 Roll up the meat into one formed piece and pull the net over it (or wrap butcher string around it). 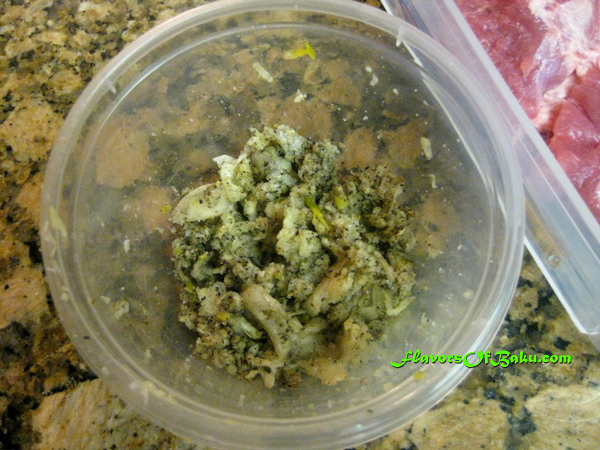 Put it in a plastic bag and marinade overnight in refrigerator. 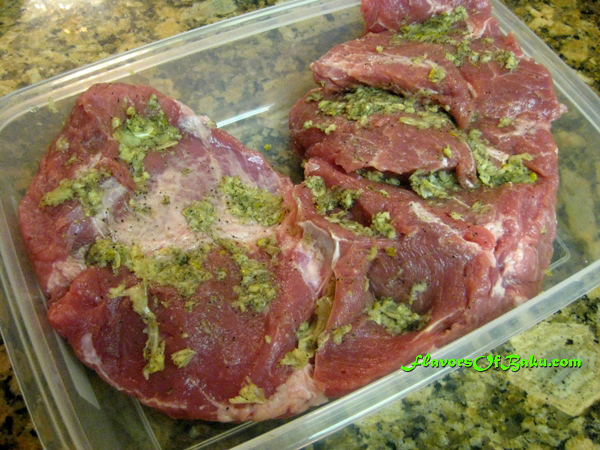 Remove the marinated buzhenina from the refrigerator an hour before you bake it, so that it warms up to room temperature. Preheat your oven to 350°F (180°C), put the marinated buzhenina on a baking sheet, and place it into the oven to roast. Cooking time depends on the weight of the meat. Let it bake for approximately 40 minutes per pound (450 g). After it is done baking, remove the buzhenina from the over and unwrap the foil. The buzhenina should be sitting in a pool of its own juice. Do not remove it from the foil just yet. 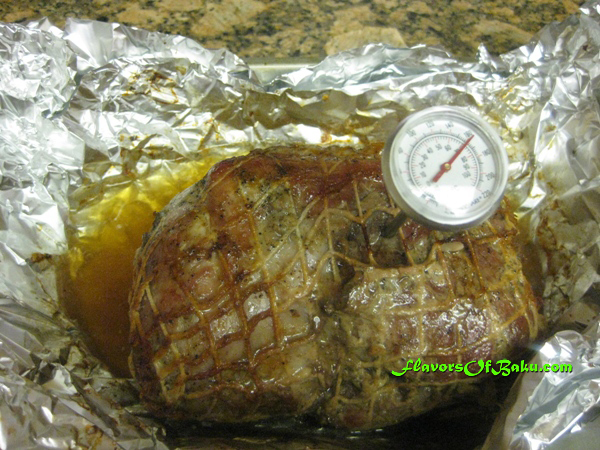 Raise the temperature of the oven to 400°F (200°C) and continue to cook the buzhenina (with the foil still unwrapped) until it is golden-brown, and your meat thermometer reads 160°F (70°C). Don’t forget to brush it with the juice from time to time. 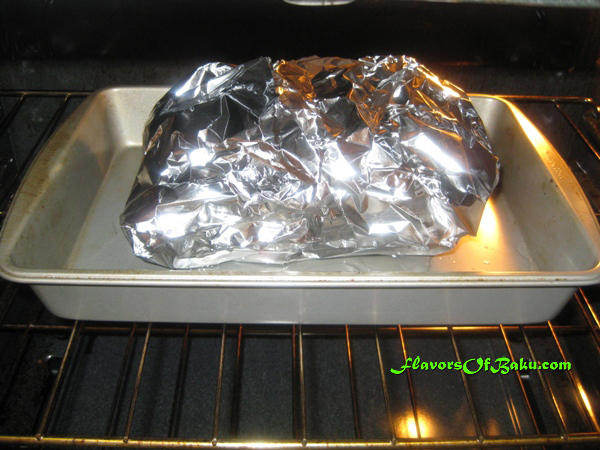 Remove the buzhenina from the oven, cover it with the foil again, and let it rest for about 15 minutes before slicing. Then take the net (or string) off (cut it with scissors if you have to). Slice the buzhenina as thin as possible into portions and serve either hot with a side dish, or cold as an appetizer. You don’t need to make gravy for the buzhenina if you plan on serving it hot, you can just serve it with its juice by arranging slices onto a serving plate and drizzle the juice over them. For a side dish, you can prepare potatoes, while buzhenina is resting. Slice skinned potatoes into pieces and cover with salt, pepper and olive oil. 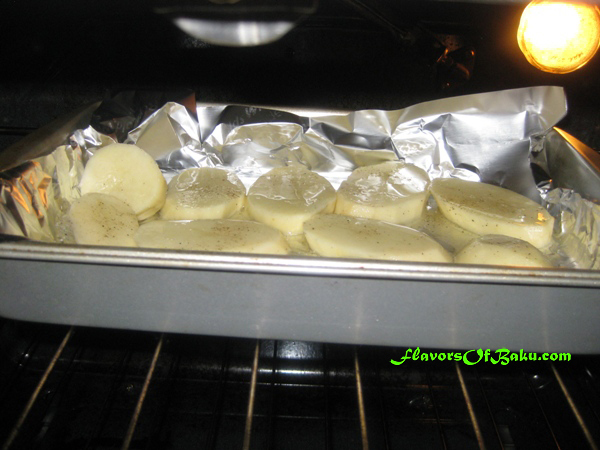 Bake them in your preheated to 550°F broiler-oven for about 20 minutes until golden-brown.